The promotional bag is really underrated. It is versatile beyond almost any other promotional item. If you really want to be creative with your imprint, there are bags that have great imprint areas, embroidery and embossing. Want to be very practical? You’re covered with simple totes or messenger bags. Need something for executives? There are really nice leather bags. Need to pass out custom drawstring bags to college students? No problem. When we think of promotional bags, the scope usually stops at the trade show bag used for collecting all sorts of paraphernalia that will ultimately be dumped into drawer (want promo items that don’t just get dumped, talk to one of iPromo’s account executives for great ideas). Choose the right bag, and it will be used long after the event and that’s great. But, there’s more to it than that. Staying with the style of bags that are usually found at trade shows, and you will find that they are great promotional items even as stand alone gifts. These promo bags usually have a larger imprint area for great designs and creativity, they’re durable and often have a large carrying capacity. As a practical, often used promotional item, the traditional bag makes a great grocery tote and everyday use item. But they go way beyond that. The drawstring bag is a great standout for people who carry small items around or go to the pool / beach or sporting events. Promotional drawstring bags are popular among students and young adults as they ride their bikes and boards. As one of the most economical promo items, this bag gets great impressions, lasts a long time and is extremely useful. Stepping up on the price point a bit, and you can start looking at custom backpacks which are popular among young adults and workers commuting by public transportation or walking to work. 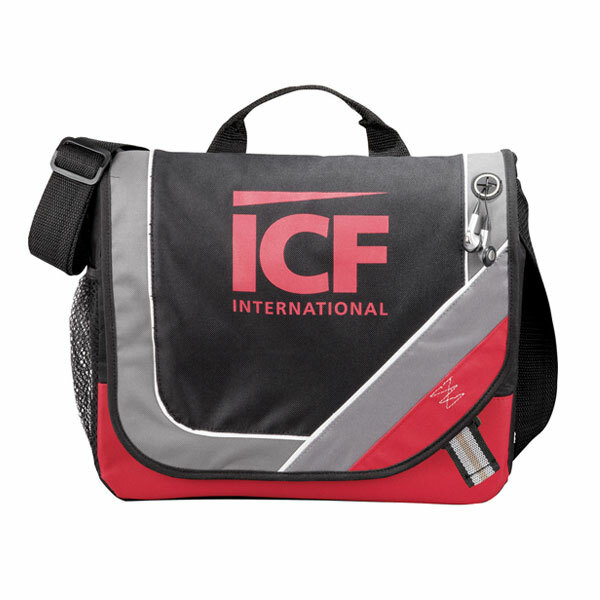 These bags make great employee gifts, creating a connection with your workforce and promoting your company… kind of a walking recruitment billboard for you. Going higher up the line, laptop bags come in a wide price range with materials starting in vinyl going up through leather. They typically have generous document compartments with specialty pockets for pens, cell phones and smaller items, in addition to the computer area. These bags tend to have really nice decoration options for your logo and some can even be personalized for the individual recipient. You can really make a statement with these, showing employees or important customers how much you value them. The draw string bag is great with water bottles and waterproof cell phone cases. When creating the package, consider the outdoor nature of the use people have for these bags. Computer and messenger bags with custom pens or power banks make a great combination gift. Leather or vinyl padfolios are also great combined with the computer and messenger bags. Backpacks are really versatile, but some great package ideas include water bottles, earbuds, portable chargers for cell phones and folding umbrellas that fit well inside. Since the backpacks are generally going to be used by people commuting, things that will be handy on the go or when caught in bad weather make a lot of sense. However you gift a promotional bag, either stand alone or as part of a promo kit, you can find the perfect bag for your event or promotion.